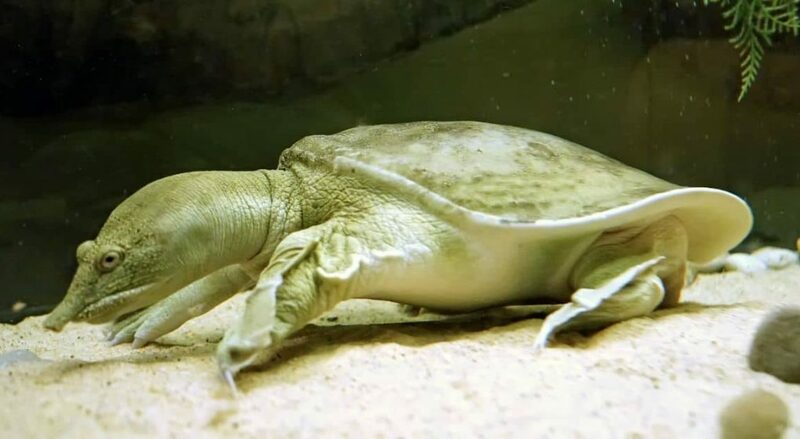 Native to East Asia, the Chinese Softshell Turtle (Pelodiscus sinensis) is an exotic-looking turtle with leathery shells and a snorkel-like nose. These aquatic turtles can grow up to 10-13 inches (shell length), and the males are usually smaller than the females but not by much. This species of turtle belongs to the softshell family, Trionychidae, which include other popular turtles such as the American softshell turtle, Cantor’s giant softshell turtle, Florida softshell turtle and many others. As with most aquatic turtles, Chinese softshell turtles prefer to spend most of their lives in water. An interesting adaptation of this species is the ability to absorb oxygen through their skin and the lining of the throat when fully submerged in water. Although this species was originally (and still are) farmed and collected as food across Asia, they have become pets in many parts of the world such as California, and Italy, where their odd appearance makes them popular even though their upkeep can be challenging. Their leathery soft shells make them susceptible to infection and injuries as compared to their hard-shelled cousins. It is important to keep their habitat clean to prevent shell fungal infections. These turtles are agile swimmers and good hunters. Also, they will bite and scratch if touched. Since their bites usually draw blood, they must be handled with care. The Chinese softshell turtle prefers to eat while in water. In the wild, they are carnivorous and eat insects, worms, crustaceans, and fish. Occasionally they will also feed on marsh plant seeds and leaves. If you decide to keep this turtle as a pet, you have to feed it high protein based diets. You can feed them with a diet of aquatic insects, crustaceans, mealworms, bloodworms, mussel, pieces of fish, and frozen prawns. Another alternative is to feed them commercially manufactured foods specifically designed for aquatic turtles such as ReptoMin Floating Food Sticks. Try to feed them on a regular schedule too, one thing you can do is to use an automatic turtle feeder. This will ensure, they get all the needed nutrients, vitamins, and minerals. You can then complement their meals with some of the low-fat proteins mentioned, and cuttlefish bone. This turtle will eat and tear up decorative aquatic plants in their tank. Also if you keep live fish in the same tank as this turtle, they will try to hunt and prey on the fish. Adults are even capable of hunting fish larger than they are. In the wild, the Chinese softshell can be found in slow-moving creeks, canals, rivers, rice paddies, marshlands, ponds, and lakes. When kept as pets, they require large turtle tanks. The average adult turtle requires a tank that can hold about 120 gallons of water. This is quite large and for good reason. These turtles are quite messy and a small tank can lead to them getting an infection. As they are highly territorial, it is a good idea to keep a single turtle in a tank. They are aggressive and may violently attack other Chinese softshell. When getting a water filter for your turtle tank, ensure that it is powerful enough to keep the tanks clean at all time. We recommend a filter that is rated for an enclosure twice the size of your turtle’s tank. In addition, the water temperature should always be between 75 and 84 °F. You can do this with an aquarium heater such as the Hygger Titanium Aquarium Heater. Turtles regulate their body temperature by alternating between swimming and basking. Basking also allows the turtle to dry off (which helps to prevent infections). Providing a basking area is, therefore, important. The basking area provided should be large enough to accommodate an adult. A basking platform such as the Penn Plax Above-Tank Basking Platform will provide adequate basking space for your adult turtle. The basking area needs to be warmer (about 90 °F) than the water. A reptile specific UVB light will help keep the basking platform warm as well as providing the turtle with the ultraviolet rays needed for the synthesis of vitamin D3. Lastly, you need to light up the tank using cool fluorescent lights. A timer can be programmed to turn the lights on and off to mimic the passage of day and night. Both females and males of this species reach sexual maturity from ages 4 to 6. Their mating period is usually between March to September. In Japan, however, they mate only between May and July. Females will retain sperm from the male up to almost a year. They will then lay the eggs in clutches, between 2 to 5 clutches a year. Each clutch is usually made up of 8 to 30 eggs. The main threat to this turtle is humans. In Asia, the Chinese softshell is used in the preparation of several meals such as turtle soup and hōtō noodles. Because of their drastic population fall in the wild, they are extensively farmed as food. Millions are farmed around the world making them the world’s economically most important turtle. While the Chinese softshell turtles are not endangered, the International Union for Conservation of Nature list them as a vulnerable species. This status is down to the loss of habitat and collection for food. The Chinese softshell turtle can be a difficult yet rewarding turtle to care for. Their tank needs to be clean at all times, and they are susceptible to injuries and infections due to the soft nature of their shells. They are feisty creatures that cannot be handled without protective gloves and will bite and scratch when approached or touched. However, they are exotic looking and swift swimmers. These characteristics make them a delight to raise. 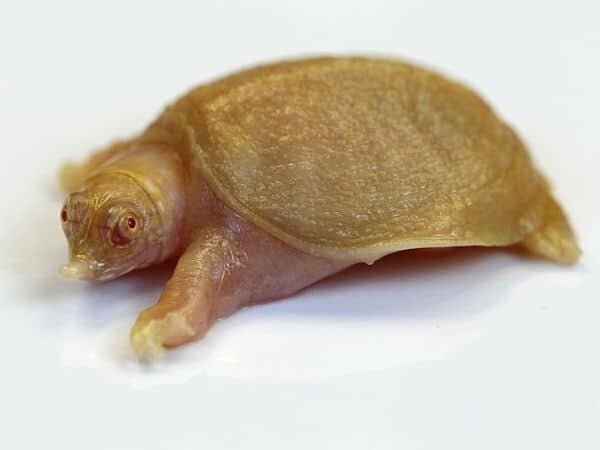 If you are looking to get this turtle, make sure you get it from a reputable pet shop or breeder. Over to you! What do you think? Do you have one? Let us know below in the comments.